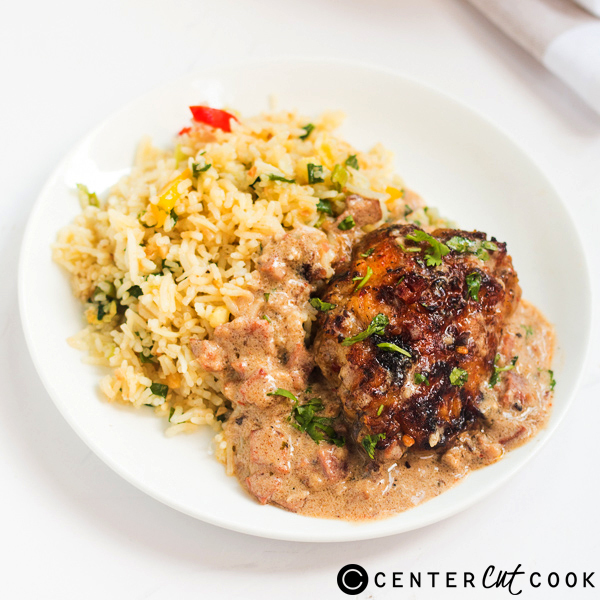 Intensely flavorful chicken smothered in a creamy sauce loaded with bacon and herbs is a dish that you will make over and over again for your family. 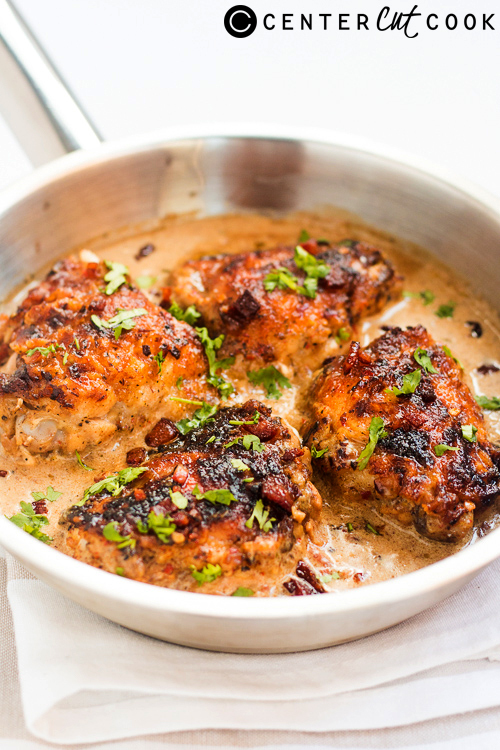 We truly believe that bacon makes everything taste better, and you will too, when you have a bite of this delicious, crispy chicken in creamy bacon sauce. We love it so much that it makes a weekly appearance on the dinner table now. This is one of those feel good, comfort foods that leave you feeling all warm and fuzzy after a hearty meal with your family. Kids especially love this dish, and for once, aren’t picky with their food. Plus this makes for great leftovers! Shred the leftover chicken, thicken the sauce and you have the makings for a great sandwich layered with more bacon. The chicken is flavored with herbs and garlic, cooked in bacon fat and then simmered in a creamy bacon sauce. This one adds up some calories so it may be a good idea to balance it out with a large green salad and warm crusty bread on the side. A glass of wine doesn’t hurt either. Rub one teaspoon minced garlic and lemon juice on the chicken and keep aside. Heat a skillet and add the bacon. Fry the bacon for 4-5 minutes till nicely brown. Remove the bacon with a slotted spoon and set aside, while leaving all the fat in the pan. Season the flour well with salt and pepper, and dredge each chicken piece lightly with the flour mixture. Add butter to the pan and slide in the chicken pieces one by one into the pan. Pan fry on high heat for 3-4 minutes on each side till golden brown. Remove the chicken and set aside. In the same pan, add the remaining tablespoon of garlic and onions. Stir fry till the onions are cooked. Add the bacon, oregano, salt, pepper and chicken stock and bring to a boil. Add a tablespoon of flour to 1/4 cup water and stir till no lumps are visible. Add this to the pan, and stir continuously while bringing to a boil. The sauce should thicken up slightly. Add the chicken pieces, and cover and cook for 20 minutes. Once the chicken is cooked, stir in the fresh cream. Add a little more stock if required. Adjust the seasoning and switch off the flame. Stir in the parsley and serve hot.